In an effort to discover intelligent extraterrestrial life, Carl Sagan sent a broadcast known as the ‘Arecibo’ message into space via radio waves. The message aimed at ET was the most powerful radio broadcast ever beamed into space by mankind. In comparison the signal sent out into space was a million times stronger that a typical television transmission. Directed to a star cluster located over 25,000 light years away, the pictorial message was sent in hopes that one day we would receive a similar response. The radio signal included our planet’s location within our star system, core principles of math and science and the antenna that was used to transmit the signal, all characteristics that an intelligent alien civilization should understand. 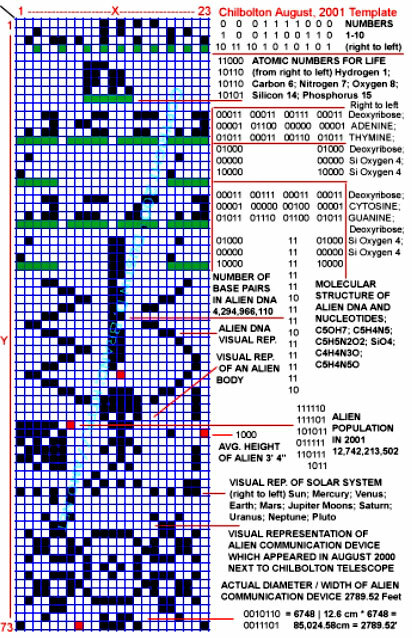 The message prepared by Carl Sagan and his colleagues also included information about our species even our physical appearance was included in the radio message as well as our DNA code. It was considered by many as one of the most impressive and important crop circles ever to appear on our planet, since this crop circle, unlike others, carried a message from space. Incredibly, just a year before the Extraterrestrial message was found, in the year 2000 a crop circle which was of an unknown shape appeared next to the Chilbolton. A year later the puzzle was put together, and we could see that the crop circle that appeared in 2000 was, in fact, a depiction of the microwave telescope used to transmit the signal to us. In 2001, three days after the mystery response appeared next to the Chilbolton; another crop circle was found depicting what seemed to be a face. Whether or not the crop circle that appeared next to the Chilbolton was, in fact, an alien response is still up for debate. However, many people are firmly convinced that not only is the Chilbolton crop circle of 2001 a real message from another intelligent alien civilization in the universe, but we receive similar messages nearly every day.